With Mobile World Congress now in the rearview mirror and South by Southwest coming up this weekend, let's take a moment to compare the late-winter, tech-based marketing festivals. 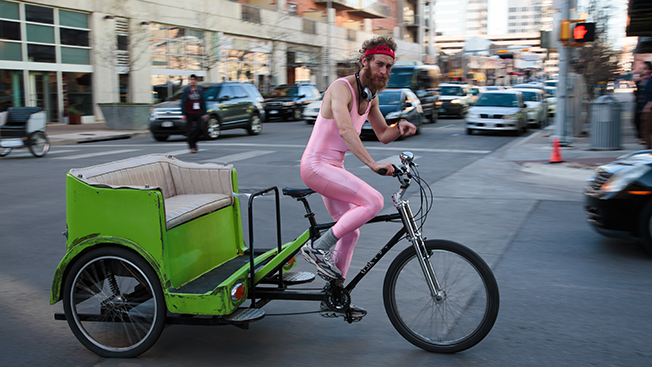 Here are seven ways in which SXSW is different from MWC, and vice-versa. While it's true that break-out players—like Twitter in 2007 and Foursquare in 2009—haven't manifested in the last few Interactive festivals, South by's Startup Village is still a fascinating place to visit. And that entrepreneurial spirit will be embodied by the keynote address from Lyft co-founder Logan Green on Monday. MWC also has a healthy innovation vibe, but it's much more of a sidebar compared to SXSW. It's practically just one blue blazer and pant suit after another, with plenty of sales folks who probably remember Watergate. Of course, there's nothing wrong with that—MWC is simply older and more buttoned up. Even a few milllenial tech reporters showed up in suits and ties. South by Southwest, while becoming more formal in recent years thanks to brands invading the premises, is still essentially "come as you are." Jeans and short-sleeve shirts rule the scene. Several years ago, SXSW Interactive programming was more specifically aimed at technologists. But the conference has recently begun tapping speakers with a wider range of specialties to broaden South by's appeal. For instance, last year's keynotes included U.S. government whistle-blower Edward Snowden and Cosmos star Dr. Neil deGrasse Tyson. And this year, digital will be part but not all of the focus for two of the five keynote speakers: women-and-workplace global activist Princess Reema Bint Bandar Al-Saud; and MoMA architecture and design senior curator Paola Antonelli (pictured). Also, there's Martine Rothblatt, United Therapeutics' CEO, who will speak about human life in an age of radical innovation, a discussion that centers more wholly on tech than the above pair but is still existential at heart. In the final two days, the cut-and-dried, code-happy tech speakers will hit the stage: Lyft's Green and Google X's Astro Teller. Mobile World Congress, on the other hand, is nearly all about the nuts and bolts of the wireless marketplace. It's where you go to understand why the infrastructure isn't there yet for the Internet of Things to truly take off, how the mobile spectrum is sold and just how amped geeks are about our 5G futures. That's not to say there isn't totally fun stuff at MWC, since the weird and wonderful gadgetry and emerging tech nearly rival the Consumer Electronics Show in terms of scope. But the show is strictly focused. Last year's South by Southwest drew roughly 32,800 registrants to Austin, Texas, and the festival's promoters are expecting a slight uptick this month. Mobile World Congress attracted 85,000 attendees to Barcelona, Spain, last year, and more than 93,000 people participated last week. Moving forward, the Austin Convention Center is the solar system in which South by Southwest goers orbit during the five-day event. Conversely, the MWC's Fira Gran Via venue is more like—staying with the intergalactic theme—a galaxy. It resembles a gigantic airport, with moving walkways, pop-up shops, and restaurants with foods from around the world. And every hundred yards, there's an outdoor beer garden where attendees drink, smoke and eat. So not only is MWC larger, it's fancier. This item is definitely connected to Nos. 2 and 4 on this list. The massive booths at MWC for Intel, Ericsson, Huawei and others—and the fact that they were so consistently busy—demonstrated that actual deals were being pitched and hammered out at MWC. Consider this: According to a source, one huge Asian telecom brought 1,150 reps to Barcelona who stayed in pricey hotels nearby. If you multiply that number by €2,000—a conservative lodging estimate—the telecom spent at least €2.3 million (equivalent to $2.5 million) on hotels alone. That doesn't count the likely millions of Euros it invested in its gigantic booth. So, sales reps likely had a field day, otherwise their employers wouldn't go all-in on MWC. Does business get done in Austin? Of course. But it appears to pale in comparison to the handshake-and-grin scenarios of MWC. Hey, that's no knock on Barcelona's delicious paella, Catalonian cuisines and splendid wines, but barbeque, Tex-Mex and Lone Star beer are embedded in the South by Southwest experience. The food trucks are almost a show unto themselves in Austin, and strolling down 6th Street to choose a restaurant is an enjoyable part of the trip. These are the easy calls. The live tunes during South by Southwest's Interactive segment—not to mention its Music section—is always something to look forward to in Central Texas. The Film section also offers superb access to new independent flicks. And as the image at the very top of this post shows, people in the streets add to the entertainment, helping maintain the city's slogan: Keep Austin Weird. Lastly, Barcelona has endlessly beautiful squares and plazas—not to mention Antoni Gaudí. From Casa Vicens to La Sagrada Familia, the architectural marvels of Gaudí alone make the long flight across the pond worth the effort.